TUMO is growing its management team. We’ve added 10 new senior level positions and are recruiting top professionals to join us in our mission. We’re looking for department managers, center managers, business developers and directors of strategic areas of development. The TUMO Center for Creative Technologies is a new kind of learning program at the intersection of technology and design. We opened our doors six years ago and have been growing ever since. We now have four centers and are building two more in Armenia. We recently started to get some international attention. CNN, BBC, PBS and others did pieces on us and we were called one of the world’s most innovative education programs. In 2018, we will open TUMO centers in Paris, Moscow and Beirut, with half a dozen more expected after that. This international franchise network will give us the revenue we need to add more free-of-charge locations across Armenia. We’re going beyond the 12-18 age range. We’re creating new programs for university students and young professionals, with new multi-million dollar investments: TUMO Studios is a design education and product development initiative with a focus on craftsmanship, and TUMO Labs is our engineering and applied science program built around hands-on projects in fast-growing high tech sectors. Around Yerevan’s Tumanyan Park, where our headquarters are located, we’re developing an urban master plan that will create over 20,000 square meters of educational spaces over five hectares, with associated facilities and transportation infrastructure. IS IT YOU WE’RE LOOKING FOR? We need people who are highly energetic and productive, and who have the know-how and experience that will allow them to hit the ground running. Although we’re an Armenian entity and not for profit, we welcome people from abroad who are willing to work and live in Armenia or our international locations for at least several years and who have a background in the commercial sector. We would love to welcome you into the TUMO family so we can grow together and change the way young people learn. Take a look at our website and social media, check out our job descriptions below and, if you think you might be interested, send your resume or LinkedIn to 10managers@tumo.org along with a short message. TUMO has a growing team of over 60 workshop leaders, each of them highly specialized in one of our learning targets, from game development and computer programming to animation and music. Reporting to the CEO, the Workshop Department Director, manages that team, including recruiting, training, oversight of the teaching process, logistics and team building. The ideal candidate would have experience in leading large teams in mission critical business processes, a background in teaching or education management, and the ability to create a fun and highly productive work culture. You will need proven analytical skills, at least ten years of work experience, and an impressive track record in team management. Fluency in spoken Armenian and written English are essential. TUMO’s educational model, software and content are being deployed in multiple countries, generating revenues that will allow us to fund the creation of more centers throughout Armenia. The head of franchise operations will further develop the standardized manuals, policies and procedures for the expansion of TUMO’s franchise network abroad, create new financial and pricing models for franchisees, and help adapt the TUMO model to local conditions at each location. The Head of Franchise Operations would be someone with multiple years of experience with business development and operations, including budgeting, project management and client relations. The ideal candidate would have international experience across several countries and the skills needed to help manage the franchise network and expand it into new territories. Excellent communication skills in English and financial modeling experience are essential. TUMO Labs is a technology education program we are launching for university age students and young professionals. As part of TUMO’s multi-million dollar European Union funded initiative, it complements local universities by providing innovative project-based learning opportunities in cutting edge fields. Projects are designed in collaboration with leading companies and professionals worldwide and can lead to the creation of startups that are then incubated at the lab. The Director of TUMO Labs will manage the creation of the center, from educational programming, recruitment of participants and hiring of staff to space planning and logistics. Once the program is launched, the Director will be responsible for operations, partner relations and oversight of educational outcomes and startup creation. We’re looking for someone with strong technology and engineering experience as well as academic credentials, who has managed small but dynamic teams and ideally run a business unit with P&L responsibility. TUMO is a dynamic environment, with multiple projects being developed and implemented simultaneously, with varying timeframes and scopes. Some of these are donor-sponsored, while others are initiated internally. Project Managers report to the senior management team or the CEO and are assigned to one or more special projects at any given time. We are looking for mature multi-taskers with a great attention to detail and the demonstrated capacity to take responsibility for timelines and deliverables. Project Managers will need excellent communication skills and the ability to work across departments and with multiple external partners. Years of experience managing small teams and projects is a must, as is fluency in spoken Armenian and written English. The Business Development Manager will be responsible for finding and developing new opportunities for grants, donation and partnerships that can further TUMO’s mission. Opportunities will include grants by international donor organizations, major philanthropic institutions, individual donors and corporate sponsors. The Business Development Manager will lead the discovery of such opportunities, the writing of proposals for them and, in collaboration with the relevant departments within TUMO, the development of programs to implementing projects funded by them. The ideal candidate will have a track record of business development and managing partner relationships, in addition to extensive experience writing grant proposals and developing project plans and budgets. Experience with developing business plans is a major advantage. Excellent communication in written and spoken English is essential. TUMO is opening several new centers in Armenia and will be rotating some of the managers of existing branches to other locations and positions as we expand our operations. This has created the need for new branch managers for various current and upcoming centers. In addition, we are splitting our Yerevan operations into a branch function and a headquarters function, so one of the branch managers we are hiring will be in charge of the Yerevan branch. Branch managers are the local representatives of TUMO and embody our values and pedagogical philosophy. Each Branch Manager will be in charge of the flawless operation of their centers, recruiting and managing all branch staff, including learning coaches and administrative staff, interfacing with local counterparts such as local government bodies, and managing relations with students and their parents. Candidates will need to have proven leadership qualities, be detail oriented and diplomatic, and have multiple years of experience running small teams and managing customers or stakeholder relations. TUMO Moscow will be a large Russian language center supported by the Municipality of Moscow and scheduled to open its doors in September. It will offer the standard TUMO program, including self-learning activities, workshops and project labs. TUMO headquarters will be in charge of setting up and launching the center, operating it during an initial period of at least one year, and possibly handing off management of the center to a local operator at the end of that period. The TUMO Moscow Manager will report directly to TUMO headquarters and will be in charge of recruiting and managing all local staff, including coaches, workshop leaders and administrative staff. The Manager will also be in charge of pre-opening operations, including coordinating the renovation and furnishing of the facility, procurement of equipment, recruitment of local staff and coordination between TUMO headquarters and local partners in Russia. TUMO Beirut is the first of several centers scheduled to open in the Middle East. It is currently under construction and will open its doors this year. It will be followed by centers in Dubai, Doha and Abu Dhabi over the next several years. TUMO Beirut will offer the regular program in English for the general public and in Western Armenian for the local Armenian community. TUMO headquarters will be in charge of setting up and launching the center, operating it during an initial period of several years, and possibly handing off management of the center to a local operator at the end of that period. The TUMO Beirut Manager will report directly to TUMO headquarters and will be in charge of recruiting and managing all local staff, including coaches, workshop leaders and administrative staff. The Manager will also be in charge of pre-opening operations, including procurement, deployment of furniture and equipment, recruiting local staff and coordination between TUMO headquarters and the local partners in Lebanon. TUMO students produce a very large volume of content as a result of their hands on work in workshops and learning labs, and occasionally in self-learning activities. Some of these results have become very visible. Some video games are available on app stores, photography, filmmaking and animation results have been shown at international exhibitions and festivals, and TUMO regularly puts on exhibitions of student work. Yet a large number of results are not sufficiently showcased, and we suspect that many worthy results go unnoticed even by us. The Student Results Curator will be responsible for internally scouting for talent among our students, discovering their best work, and finding optimal ways of showcasing them. In some cases, the Curator will work with our events team to put on exhibitions both at TUMO and at other venues. In other cases, the Curator will help students participate in international competitions. The ideal candidate will be someone with a background as an art director and significant academic and professional experience in exhibition design or curatorial work. TUMO is building new centers and expanding existing ones in various towns in Armenia. We are also launching programs for university age students and young professionals with multi-million dollar construction projects. In addition, we’re developing real estate and infrastructure and carrying out master planning around the TUMO headquarters in Yerevan and the adjacent Tumanyan Park. And finally, we are assisting with construction and renovation projects for TUMO’s new international locations. The Senior Construction Manager will oversee TUMO’s construction operations, bringing some construction management activities in-house, supervising quality, assisting in procurement of construction material and services, and interfacing with general contractors, architects and partner organizations. The ideal candidate will have extensive construction management experience internationally as well as experience with the construction industry locally in Armenia. Working knowledge of both Armenian and English is essential. 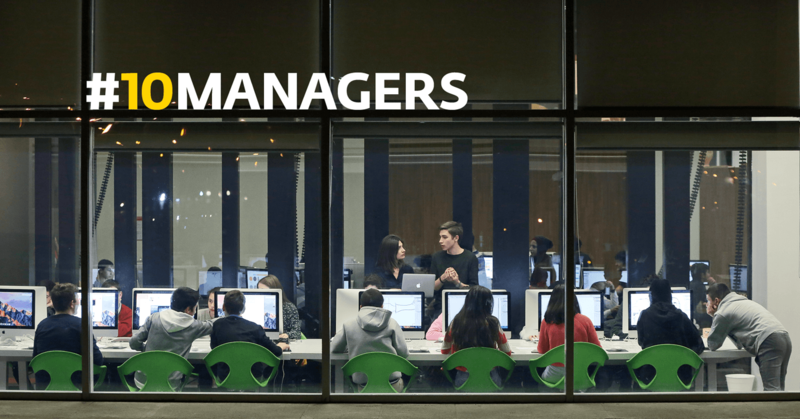 To apply, send a short message to 10managers@tumo.org with your resume or LinkedIn.